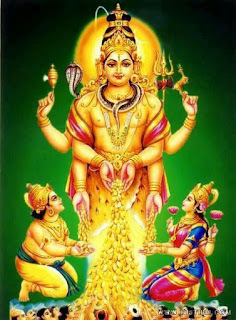 According to the Puranas, Lord Yama requested Lord Siva to get Him an intelligent chief minister and chief accountant for looking after the good and bad deeds commited by the human beings. Lord Siva in turn told Brahma, and Chitragupta was born to the Sun God and Neeladevi. Chitra means collection of pictures and Gupta means Hidden. Chitra Poornima is the day sacred to Chitra Gupta, the Keeper of Deeds. Lord Brahma created Chitra Gupta through the Sun God and He is considered as the younger brother of Lord Yama. 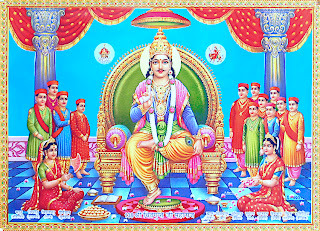 It is said that Chitragupta examines the good and bad performances of the person. When a person dies, his soul first goes to Lord Yama, where Chitragupta tallies the deeds and report it to Yama. tracks every action of every sentient life form, building up a record of them over the course of their life so that when they die the fate of their soul can be easily determined. Chitra Pournami is a ceremony observed on the Poornima day (full moon day) in the Tamil month of Chitirai (April–May). Chitra Pournami ritual commemorates Chitragupta who according to the scripts is the assistant of Lord Yama, the God of Death. The day is also dedicated to Indra, the head of Devas. It is on this day that the star Chitra and full moon come together. Considered as Chitragupta’s Birthday. Chitragupta is a god responsible for tracking people through their lives to determine where they go after they die. He is the son of Lord Brahma, the creator of the Universe, and holds a fairly special place in the Hindu pantheon because of the order of his birth. Chitra Pournami is a time when your sins can all be cleansed. This is also one of the Full Moons during the year that attracts the most people to make the sacred walk around the holy mountain, Arunachala (Tiruvanamalai ). The estimate of the crowd for this night is over one million people, this in a city of about 200,000. ). Many people come and make the 14 km walk around Arunachala, and they will need to eat and drink. Most people walk on the roads that circle Arunachala, making pradakshina (or girivalam in Tamil) to Arunachala. More than half of the distance, they walk on “Hill Round Road” (or “Girivalam Road” in Tiruvanamalai. Many people would keep fasting and make the sacred walk on chitra pournami day .So by offering food like meals too many thousands of people during this night would receive the blessing from Almighty directly along with this you can vanish the karma which is on you. It is a customary to eat curd rice without salt on this day and to fast without eating anything else. In any case avoiding salt in food items throughout the day is recommended on this day, if possible. Chitragupta Temple at Kanchipuram is the only one temple in South India dedicated to Chitragupta. He reminds us of an invisible higher power that constantly watches over us, and provokes us to mind our conduct and behavior. It is believed that those who do not attain a balance between their good-deeds and misdoings have to attain a re-birth in any living form, to complete the life cycle. Worshipping him with chakkarai pongal and other things without salt will give immense pleasure to the whole family throughout the year.